I live nowhere near Sembawang, so after a visit to a friend’s house I decided to take a bus down the street and check out the area with a vague destination in my mind. I’ve always adored the bustle and colour to be found at hawker centres, especially around lunch time when they’re filled with the crush and noise of people arriving for good food. The atmosphere of the food centre at Sembawang Hills was significantly different, though, when I arrived on a wet Wednesday late afternoon. The lights were dimmed and many of the stalls had already closed for the day, making the building appear like a crouching creature waiting moodily for the rain to stop. Nevertheless I braved the rain to go in for some shelter and find out what lies in this corner of the island. Before I begin touching on the company I found on my brief foray here, I must explain that because many of our conversations had to be translated from Mandarin and reformatted slightly to fit in with the narrative structure of this blog, as well as the fact that I didn’t record any of them, I might not be able to reflect the comments of the people I met with complete accuracy. Nonetheless I have tried to convey their dialogue as true as I can to what they meant to say. Madam Tan: “Many of the stalls are already closed because it’s raining and no one wants to come here. On days when it’s not raining we get a lot of people coming for lunch, but around now many of the other hawkers are resting for the day. I’m going to close at the same time I do everyday. My mother started this shop many years ago and I took over her. Now she’s eighty years old and cannot work. My kids are grown up and working, so is my husband. I’m planning to work as long as I can. I like this job. It gives me something to do, and I also have friends here. Yes, regular customers too. Regular customers are to expected from any job. When you work, the most important thing is to have respect. So I respect all my customers. Friendly Mr Saw agreed to let me take his photograph. Mrs Saw (not in picture): “We’ve run this shop for seventeen years. His father was working at Lakeview, then he moved to Shunfu and we came here. I began working here because of him, and as I worked I grew to like the job, so now I enjoy it. I’m planning to retire one day, and when we do we’ll just close the shop. 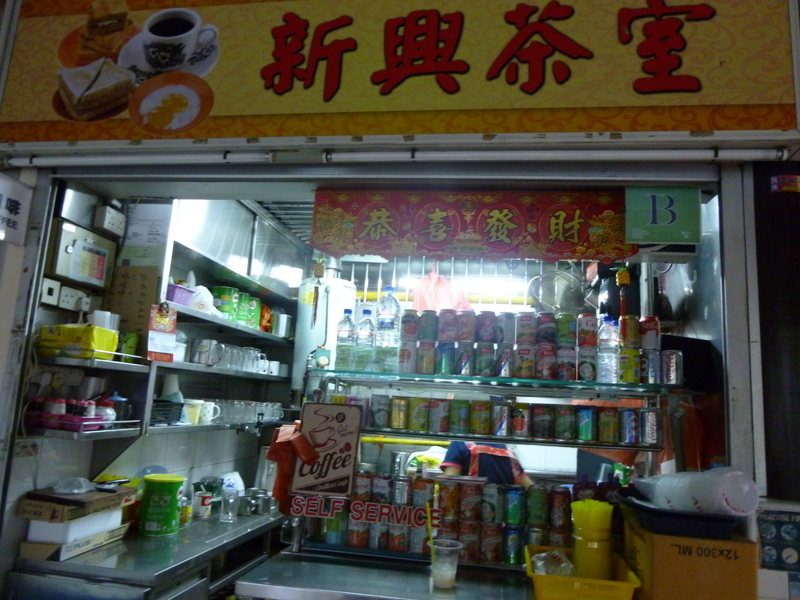 Besides this one we have many shops around Singapore managed by his workers. Our relatives are all also in the business. Though the lady at the stall declined to let me take her photograph–a pity since she had the sweetest smile–she later offered me a free bowl of laksa! What a generous woman. 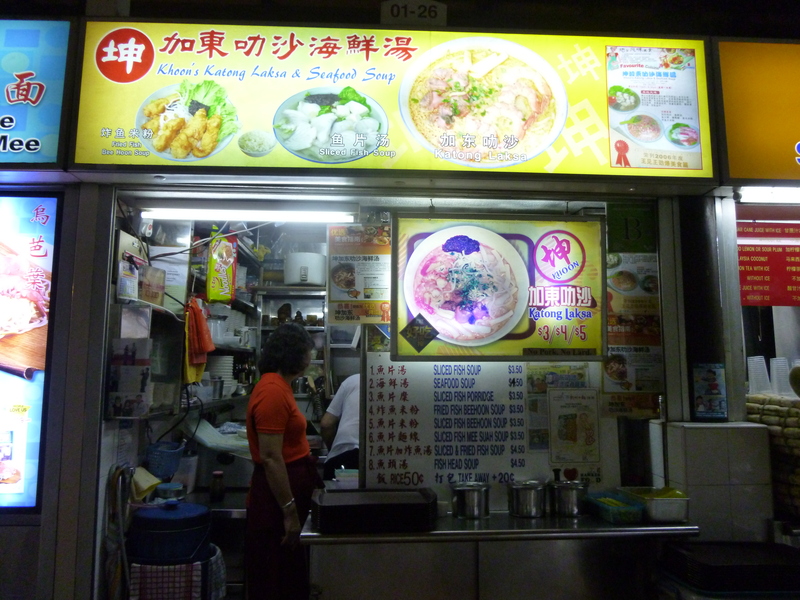 When I flashed her a thumbs-up for her cooking she even pointed cheekily to the little sign that said ‘好吃’ (Mandarin for ‘tasty) at the storefront. “We have worked here for twelve years, but there are others who have worked for much longer! 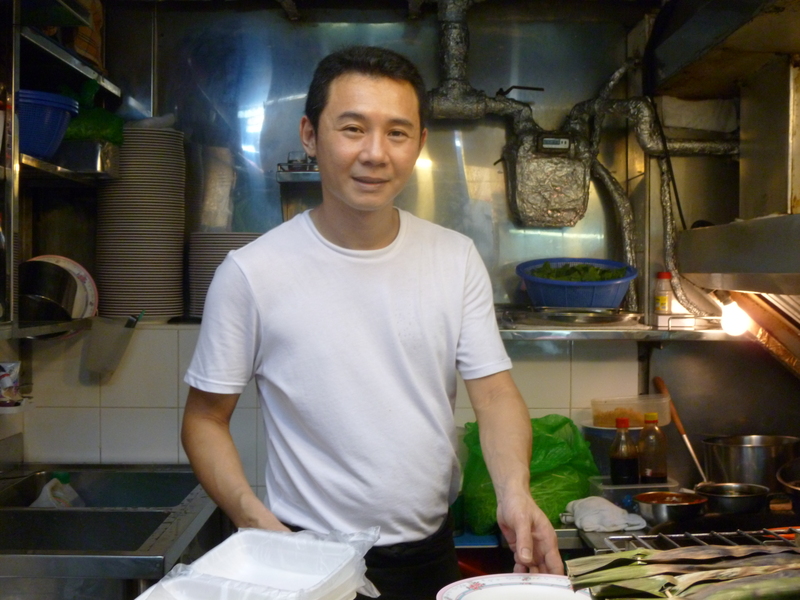 The lady selling popiah had been here long before we came; she’s been working for thirty-five years. And the man selling chestnut water has been working for more than twenty years, since he was small! My husband used to be a contractor, but later he decided to switch jobs. Ten years ago we were at the temporary premises when they were renovating this place. Now on rainy days we don’t get many people because there is no sheltered carpark so it’s inconvenient to walk here.